Could somebody please explain to me in simple terms what the "R.43" is, where it would go, and give the sources for the information? I think it would be quite similar in performance to the other Tier 5 derp guns in the game like the ones on the Pz.Kpfw. IV and M4 Sherman. My thought is that it will be somewhere between one of the derp guns and the French 105mm Mle. 1930 S. If we assume the 100mm penetration value was from 500 meters, I think we're looking at 120-140mm pen at 100 meters. Nevermind, thought you were talking about the 105/32. Edited by StrelaCarbon, Jul 02 2013 - 22:31.
and its based of a picture made by some guy in paint. notice the 18 there? does that mean its the 18th try maybe? Edited by Imperator_Gallogrecia, Jul 02 2013 - 22:34. Edited by Imperator_Gallogrecia, Jul 02 2013 - 22:42. That picture also says "design of the P.43 (28 April 1943), 1:74 scale." It doesn't seem like a totally separate design, just a variant of P.43. I read the stuff on Pg.55-56, there was a link (translated from Russian) that also mentioned an "R.26." This leads me to believe that the "P" was being mistranslated as an "R." I don't know Russian, but they have a different alphabet and it was probably just a translation mistake. radical redesign of the P.43 made in late 1943. Edited by sp15, Jul 02 2013 - 22:47. 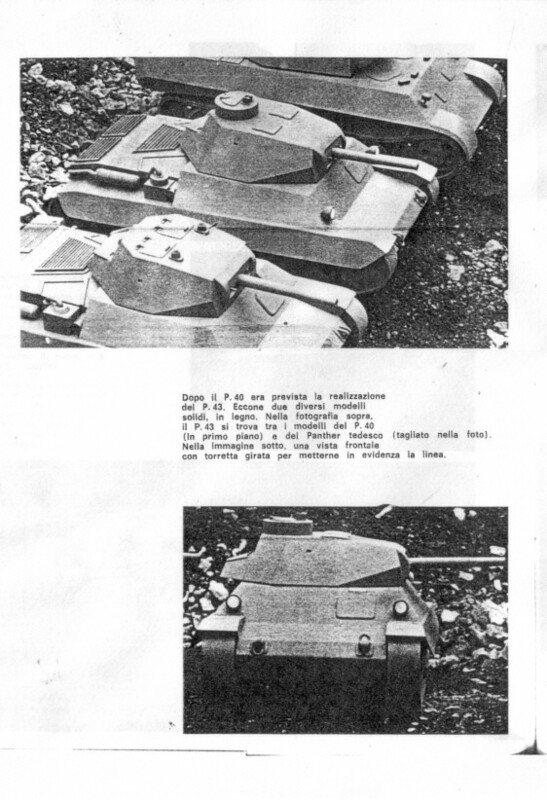 That caption actually says "The 1:10 scale model of the last Italian tank of the second world war." 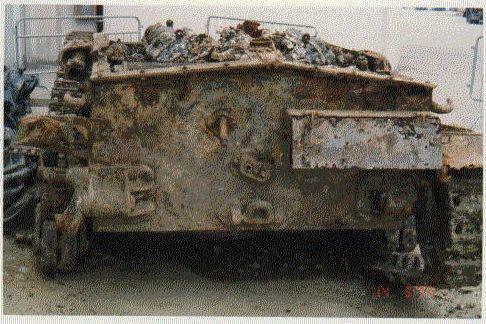 from a wrecked Semovente found in a hole in Rimini in 200 and now restored. The Italian caption says that this had an adaption made by the Germans called the 'nebbiogeno' on the right side of the hull rear. Google translate cant translate it but nebbio is fog or some such. That's because it was the last tank Italy designed during the war. 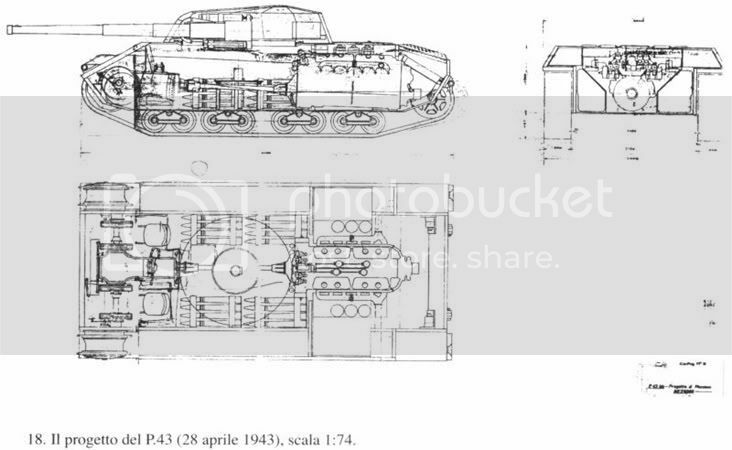 We don't hear anything regarding Italy and tanks after the P.43bis until the Experimental upgrades of the M47 Patton, and the participation in the Europanzer project. Probably a smoke grenade function of some sort. Or some sort of smoke device. I thought it was referring to the gun having such a device. Edited by Life_In_Black, Jul 02 2013 - 22:56. Now what was the turret ring diameter of the M14/41, M15/42, CMC and Celere Sahariano? 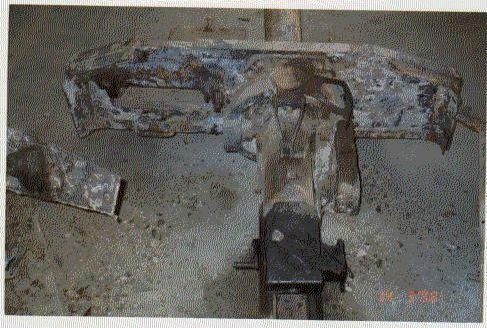 well the cmc probobly has the same turret ring diameter as the M14/41 as it was made using one. Edited by sp15, Jul 02 2013 - 23:03. That's exactly what I thought, but what is the diameter of the turret rings?!?! You would think they would have interchangeable turrets simply because of how closely allied they were (close enough to screw up Barbarossa at least!). and he never had any source to begin with. do you see what i mean with "wildly speculate"
Edited by sp15, Jul 02 2013 - 23:13. So what exactly was the S.149/12?